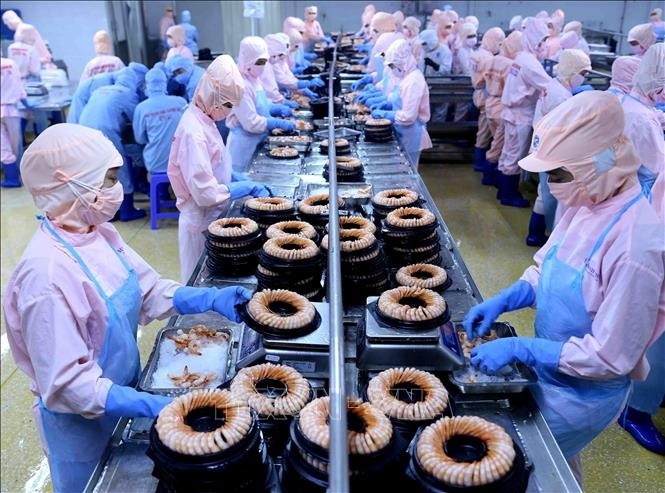 Minh Phú Seafood Corporation chaired by Lê Văn Quang allegedly King of shrimp continues to be the largest shrimp exporter in the world with export volume in 2018 reaching 751.2 million USD. Chairman of Minh Phú Seafood Corporation Lê Văn Quang says nearly 6.3 thousand tons of shrimp were exported in December; its volume reached 72 million USD, up 11.43% in quantity and 9% in value year-on-year. By 2018, the corporation`s shrimp exports have reached 67.5 thousand tons, worth 751 million USD, up 19.6% in quality and 7.7% in value compared to the previous year.“The number has helped bring Minh Phú to the leading shrimp exporter of the world, overcoming an Ecuador’s company which had held the second position”, says Quang. The convention “Significant solution to sustainable shrimp industry”, chaired by Ministry of Agriculture and Rural Development (MARD), was held in Bạc Liêu in May 2018 when material shrimp prices slumped. Such big producers as Minh Phú, Nam Miền Trung, Việt Úc committed to reducing young shrimp price by 10%, and Minh Phú promised to pay further 10% of material shrimp price. These made price of material shrimp inch up (price of white leg shrimp up further 10,000 – 12,000 dongs/kg). From late quarter 2 of 2018, farmers continued to stock, making shrimps in all kinds reach around 800 thousand tons, up 10.5% compared to 2017. According to Directorate of Fisheries (MARD), shrimp export volume is estimated to reach 3.59 billion USD, down 7.1% compared to the previous year, with white leg shrimp accounting for 2.48 billion USD (down 2%) and giant freshwater shrimp 810 million USD (down 7.8%).